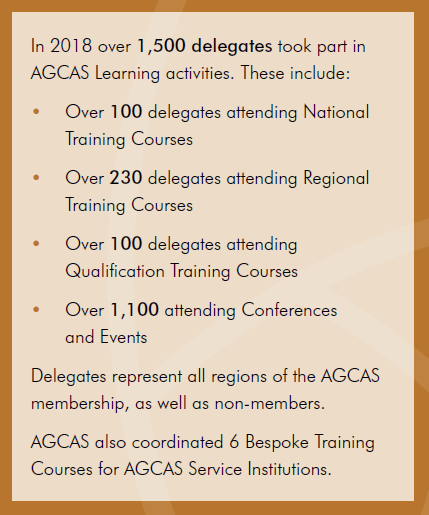 AGCAS provides cutting edge specialised training, conferences and events tailored to the modern day careers professional. Our Learning programme aspires to meet the needs of all higher education careers and employability staff by ensuring that the design, content and delivery of Learning is open, supportive and accessible to all members. AGCAS designs and delivers the residential courses offered within the AGCAS/Warwick CEIGHE (Careers Education, Information and Guidance in HE) qualification at Post Graduate Certificate, Post Graduate Diploma and MA level. We also provide high quality training courses and can deliver most national sessions, tailored to your institutions needs for your careers and employability teams. Alongside this work we also run a number of conferences. Our flagship conference is the three-day AGCAS Annual Conference for Higher Education Careers and Employability Professionals, which takes place in early September each year. We also offer regular professional updating conferences for those engaged in careers and employability research, information and advice, employer engagement and a whole host of other topical issues. Find out more about the AGCAS Mission, Vision and Strategy, and our four other core strategic areas here.